After my found sander was destroyed by a fire I invested in a 2×72 belt sander and some high quality steel and have been making knives ever since. I instantly decided to focus on kitchen cutlery because most of the knife makers I spoke with focused on hunting knives and I wanted to do something different. Plus, I wanted my knives to be used in the heart of the home to prepare meals more frequently than a hunting knife might be used. Many knife makers reproduce the same knife over and over while using the same exact materials so I decided I would never make the same knife twice. I let the customer choose the shape, length and handle material, pins and more. I like customers to visually see the different woods and handle materials and get a clear idea what their knife is going to look like. This is a very custom experience for knife users that allows them to participate in the creation of their knife. More than anything, I enjoy making custom knives, in my small shop, here in Central Texas. Travis was born in Houston, TX and raised in a small town east of Dallas called Gun Barrel City. He spent some time at the University of North Texas studying creative writing and philosophy before traveling around the US and other countries for nearly a decade. In 2014 Travis quit his job in the media business to become a full time knife maker. He lives in Belton, TX w/ his wife, son, daughter and dog. When he’s not making knives he enjoys cycling, camping and smoking brisket. Travis is class of 2013 American Blade Smith Society School of Blade Smithing. Dirk Michener is from Colleyville, TX and graduated from the University of North Texas with a degree in the Arts. Dirk has been a prolific musician for decades under the band name “Cavedweller”. 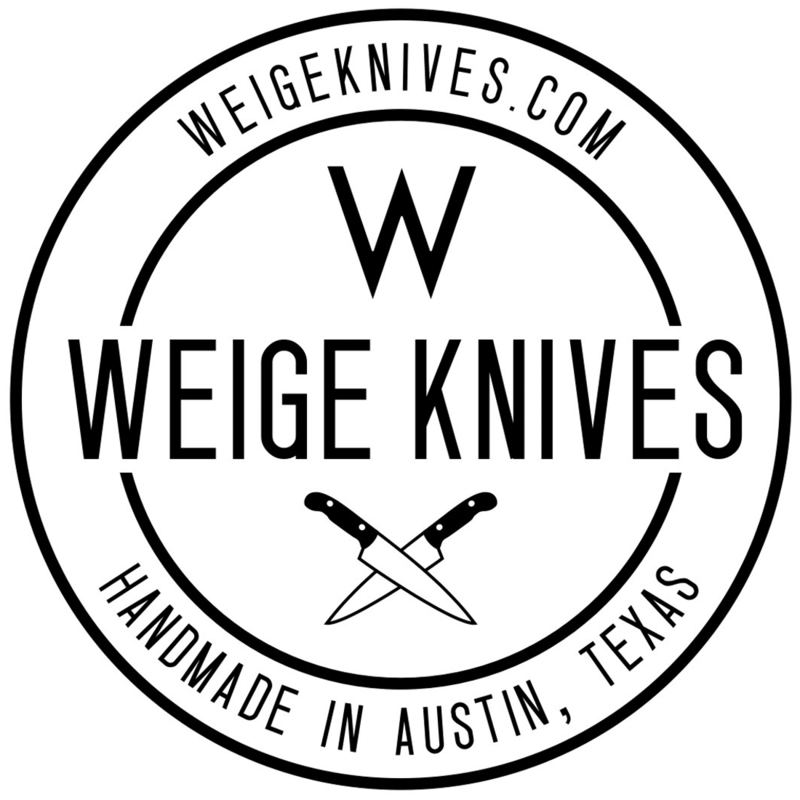 Dirk began working for Weige Knives in early 2014 to help keep up with demand. He lives in Austin, TX with his wife and dog. Dirk is class of 2013 American Blade Smith Society School of Blade Smithing. Newspapers, magazines, blogs and more. Click here for The Austin Chronicle front page story. Click here for the article in Tribeza Magazine. Click here to see us in Garden & Gun Magazine. Click here to read our feature in Edible Austin. Click here to read our interview w/ the Sustainable Food Center. Click here to watch our appearance on Hilah Cooking. Click here to read our review on Gustidude. Click here to see the photo journal from Create Six.